And more Basic Grey (I'm becoming obsessed)! This time it is the 'Cupcake' papers I have used... Catching up on recording moments with old photos, and I've used the originals here which I don't usually do. The pages fit together beautifully but were easier to photograph singly. Butterfly cut with the Cuttlebug, big tag cut by hand, ribbons and buttons from stash, primas coloured with ColorBox chalk ink and everything else (I think) from Basic Grey 'Cupcake'. I created this page last night at the association in Tourc'h with a photo taken Wednesday: We are having glorious weather at the moment! 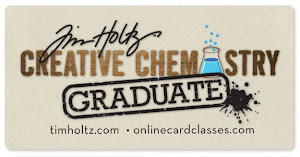 The background started as an almost plain pale blue sheet from Basic Grey 'Periphery' and I stamped it and coloured it, then added layers including a white sheet typed on the computer coloured with distress inks, and a printed label. 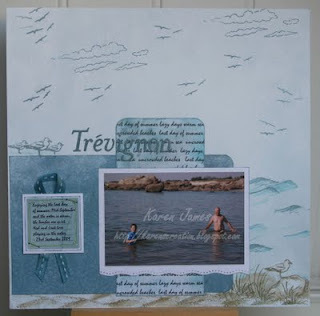 Used: Basic Grey 'Periphery' papers and alphabet; U-mount Create-a-scene 'Coast'; Distress Inks - Faded Jeans and Burlap; VersaMagic - Agean Sea; Glossy 3D; EK Success 'dotted wave' border punch; PaperMania ribbon; digital label from ScrapGirls. Used: Dovecraft square card blank with extra folds; My Mind's Eye Bloom & Grow papers and decoupage pack with ColorBox chalk inks, leaves cut on the cuttlebug, Fiskars border punch, prima flowers, gems, pearls and 3D pearl paint. 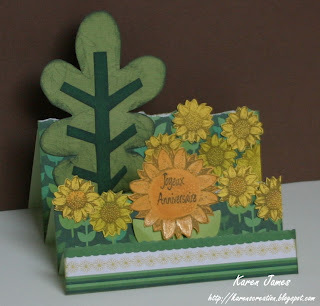 Utilisé: Une carte carré de Dovecraft; Papiers et kit découpage de My Mind's Eye Bloom & Grow, encres craies de ColorBox, feuilles découpé avec la Cuttlebug 'Leaves', perforatrice bordure de Fiskars, fleurs de Prima, pierres et peinture 3D. 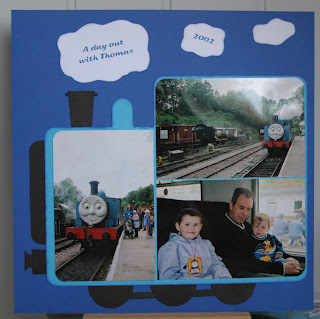 I've a bag of decoupage that I've made up but never mounted so here's one used for "Sketch Saturday" challenge #69. 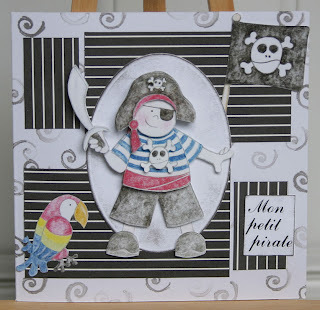 The paper is from DCWV 'All Dressed Up' and the pirate is from Jolly Nation mounted on a oval cut with Nestabilities and the Cuttlebug. 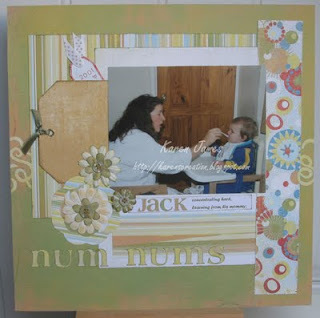 I stamped the background and used WHSmith rub-ons for the text. J'ai un sac de découpage j'ai fait mais non-montrée. Alors, j'ai mis une pour ma carte selon le sketch chez "Sketch Saturday". J'ai utilisé une feuille de DCWV 'All Dressed Up' avec un découpage de Jolly Nation et un ovale découpé avec les Nestabilities et la Cuttlebug; j'ai tamponnée le fond avec l'encre noire; alphabet rub-on de WHSmith. PaperMania papers & vellum; Whiff of Joy Charlotte angel stamped with Versafine, coloured with watercolour pencils & DecoArt glamour dust; Compagnie des elfes sentiment stamped with ColorBox queue "Pumpkin Patch". 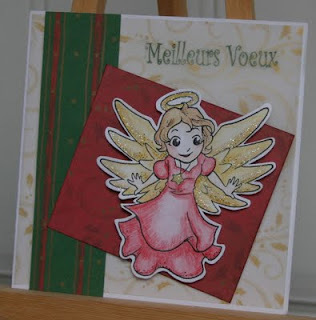 Une carte pour le challenge chez 'Sunday Stamp & Sketch' qui demande on suive le sketch et utilise le(s) tampon(s). A quick card for the sketch over on 'Just Christmas and Birthday cards'. 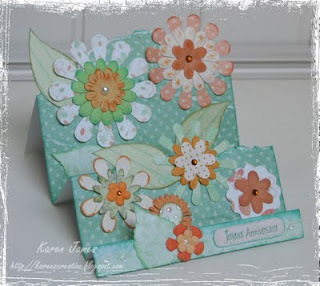 Love these Dovecraft vintage images for quick toppers! 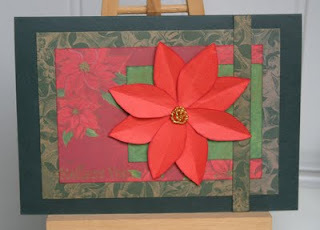 Also used PaperMania papers, Dovecraft stamp, offcut of paper for my little handmade poinsettias; ColorBox queue "Pumpkin Patch" & "Rose Petals" chalk inks. Voici ma carte selon le sketch chez "Just Christmas and Birthday Cards". J'ai utilisé: Des papiers de PaperMania, tampon et image de Dovecraft, des chutes de papier pour mes poinsettias faites à la main; encres craie de ColorBox queue "Pumpkin Patch" et "Rose Petals". The latest Basic Grey challenge uses a photo as inspiration so I've picked out the colour scheme of green and white with warmer tones, scallops on the bedspread with overhanging flowers: All papers are from BG 'Sugared' kit as well as the letters, accents and borders and I added the matching rub-ons plus Prima flowers, 3D glossy, PM gems, Inkadinkado stamps and chalk inks from ColorBox queue 'Pumpkin Patch'. DT member Jo also has yet-to-be-released BG candy! 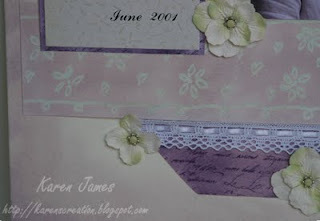 Une page pour le Basic Grey challenge selon une photo pour inspiration: Des couleurs de vert, blanc, tons plus chaud, couverture festonnée, fleurs... J'ai utilisé des papiers, alpha, fleurs et arabesque de le kit 'Sugared' de Basic Grey et j'ai ajouté des rub-ons de BG, fleurs de Prima, 3D glossy, PM gems, tampons de Inkadinkado et encres craie de ColorBox queue 'Pumpkin Patch'. This card follows sketch 1 of the latest Caardvarks challenge. I'm just not sure why the text has disappeared on the photo: It is fine in real life! Honest! 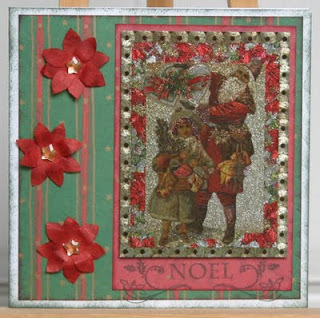 Used: Offcuts and recycled bits of card and paper, handcut poinsettia with a string of seed beads, CdE stamp with gold Brilliance. Voici ma carte selon le sketch 1 pour le challenge chez "Caardvarks". Je ne sais pas pourquoi ma texte a disparu sur la photo: Il bien existe sur la vraie carte! J'ai utilisé: Des chutes et recyclage de carton et papiers, poinsettia découpé à la main, petit perles sur un fil, tampon de Compagnie des Elfes avec encre Brilliance en d'or. 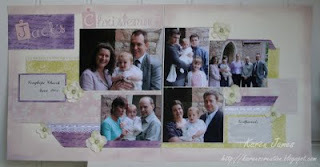 My son's Christening: Started this before the summer and finally got round to finishing it, I think?! All papers, apart from the title, started as white and were coloured by stamping and sponging with Distress Inks in Dusty Concord, Tattered Rose and Shabby Shutters. Main band of paper was embossed by hand-drawing the pattern with a Zig embossing pen and embossing with clear powder and then rubbing the Distress Ink over with a make-up sponge. Une double-page du baptême de notre fils en 2001. J'ai fait toute le coloration des papiers avec encres 'Distress' et aussi j'ai l'embossage à la main avec un stylo embossage transparente et poudre transparente donc il résiste l'encre. Title font cut with 'Fancy Pants' Cuttlebug alphabet; rub-ons by WH Smith (UK newsagents! ); flowers and spacers from Tina (thank you again, I love them), ribbons from local market. I've lots to show but I'll stagger things over the next few days otherwise it will be all and nothing again :) First up: I've been playing with step cards and made this one with the Daring Cardmakers challenge, Sunflowers, in mind. 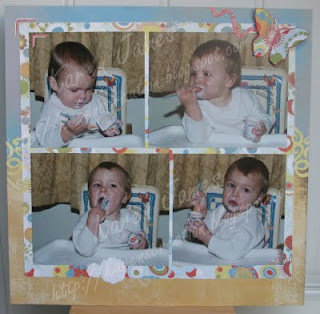 I was also aiming for a quick step card that can be reproduced in a workshop and this fitted the bill ! 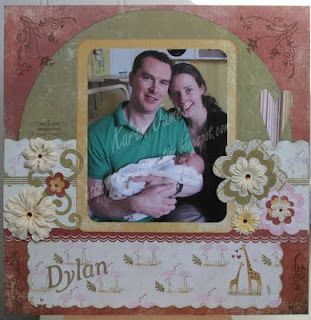 Voici ma carte pour le challenge "Daring Cardmakers" de cette semaine. Le thème est "des tournesols". C'est aussi un exemple j'ai préparé pour un atelier le mois prochaine: Une carte avec la possibilité pour faire rapidement et sans matériaux spécialisées. 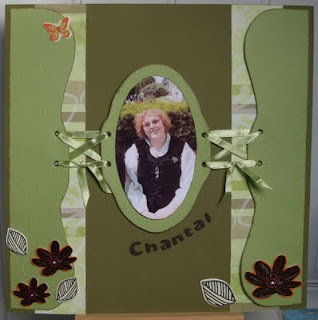 Used: Bazzill 'Palo Verdi' and 'Parakeet' embossed leaves (I drew and cut all the shapes by hand); PaperMania 'Olivine'; MME 'Bloom & Grow' ribbon; ColorBox queue 'Pumpkin Patch'; PM foam alphaminis; Dovecraft 'Wild Blossom' chipboard shapes. Deliberately wanted to keep this one simple, more in the 'European' style which is quite flat without lots of embellishments but uses shapes which reflect the photos. This made it more of a challenge for me but I had the idea of reflecting the train engine on the page... J’ai fait une page plus en le style Européen : Moins embellissement et plus avec des formes.